the system of rules which a particular country or community recognizes as regulating the actions of its members and which it may enforce by the imposition of penalties. 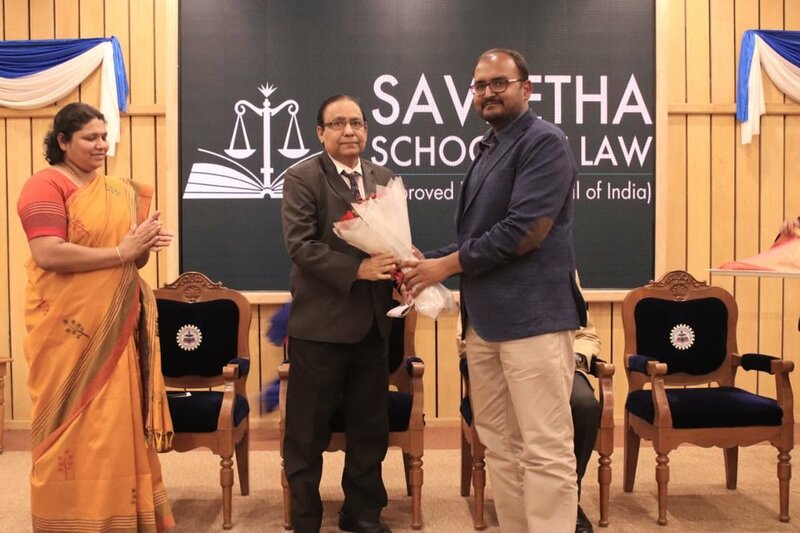 Saveetha School Of Law, Saveetha Institute of Medical and Technical Sciences organises it's flagship program of 1st JUS LEX NATIONAL TRIAL ADVOCACY AND JUDGEMENT WRITING COMPETITION, 2018 which was conducted on August 31 to September 2. Honb'le Justice C. Saravanan and Honb'le (Retd.) Yusuf Ali inaugurated the function. 22 teams from the leading National law Universities from all over the country participated in the competition. Among them Top 4 teams qualified for the semi finals. Top 2 teams from the semi finals qualified for the finals. The finals was judged by the three sitting High Court Judges of Madras High Court Justice P.N. Prakash, Justice R. Suresh Kumar and Justice R. Hemalatha. The results was a tie and the Judges declared to share the prize money. Both Alliance school of law and University Institute of legal studies was declared as the winners.